The JFX200-2513. Image: Mimaki Europe. 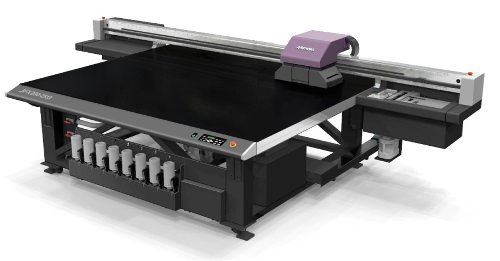 Mimaki announced the upcoming launch of the JFX200-2513, a large format flatbed UV inkjet printer that can print up to 25 square meters per hour on materials up to 2,500 x 1,300 mm and up to 2” (50 mm) thick. According to Mimaki, the JFX200-2513 is aimed at businesses in the sign and display graphics industry that wish to affordably expand their range of services. The printer will be premiered at Viscom Düsseldorf, November 7-9 in Germany, booth H31.